First launched in 2012 as a two door coupe and winner of numerous awards including Motor Trend magazine’s ‘2012 SUV of the Year’. New for the 2013 model year, amongst new technological innovations, is a five door, entry-level ‘Pure Premium’ five-door Evoque with an aluminum alloy roof and an interior trimmed in leather and Dinamica, in place of the standard panoramic laminated glass roof inside other Evoque models, joining the lineup. Once I turned over the engine and took off on my way I’ve gotten positive remarks from other vehicle drivers and people in parking lots asking me “What is it?”, “Who makes it?”, and “It is incredible looking!”. I agree as this new Land Rover Range Rover Evoque is one-of-a-kind. It certainly doesn’t look anything like the other boxy Range Rovers. No, the Evoque went from concept directly to the showroom and streets turning heads wherever it goes. When approaching the trunk with the key fob the puddle lamps light up under the sideview mirrors and you’ll see the original sketch of the truck on the pavement. I tested the new five-door Prestige model and enjoyed every minute behind the wheel driving this uniquely styled, high-performing, comfortable, luxurious and safe all-terrain sport utility vehicle. 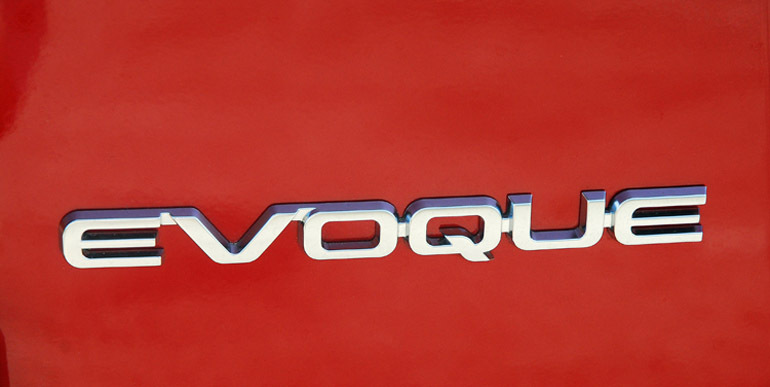 The uniquely styled Evoque features a dynamic profile with its rising beltline, a muscular shoulder running the length of the trunk and a distinctive taper to the roofline. This pinches the narrow windows with an upturned line. The sculpted corners reduce the truck’s visual front and rear overhangs. The front fascia features a unique aluminum grille and two lower air intakes for the engine and intercooler cooling. Just below is an aluminum chin slid plate that protrudes out helping manage air flowing under the truck and protection the engine from outside extrusion when off-road. Powerful adaptive HID headlights and LED foglamps light up the night for enhanced safety. 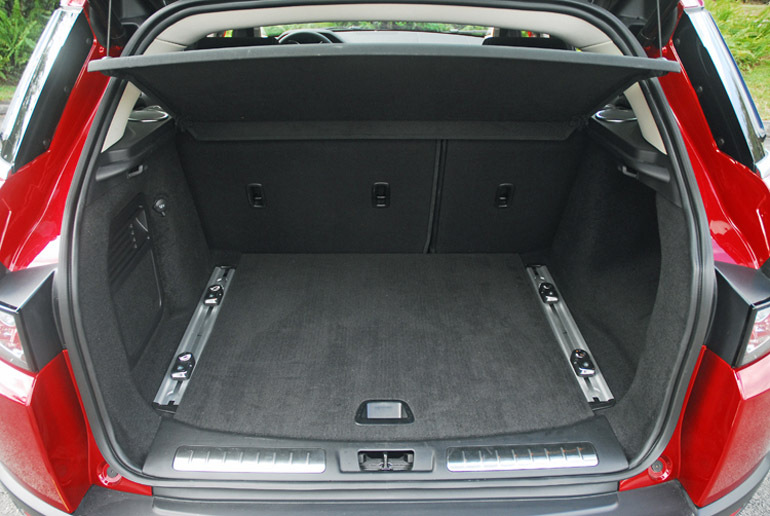 From the side is a profile like no other sport utility vehicle. The stance is low, the A-pillars are steeply raked, and a full-perimeter brushed aluminum strip rises under the windows. 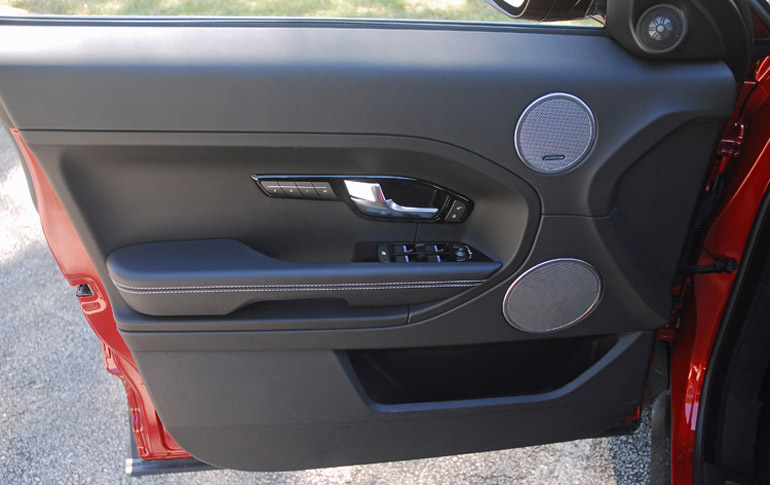 The chrome strip under the doors gives it a luxurious look while the lower side extensions contribute to a lower center of gravity. 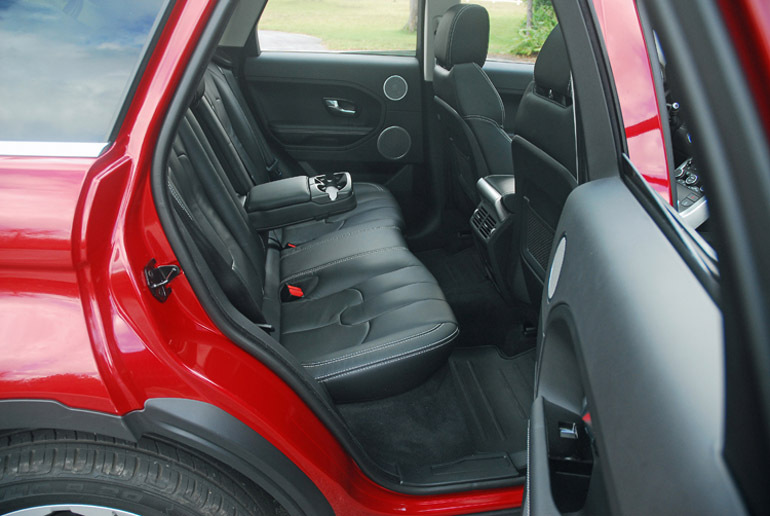 The sculpted aluminum side vents also adds to the look of motion even when parked. The flared fenders of my Evoque Prestige model came stuffed with large 245/45R20 inch Continental Cross-Contact tires wrapped with unique five-prong spoke 20X8 inch aluminum alloy wheels. Out back the rear window gets pinched but rearward visibility remains excellent. On top of the window is a spoiler to enhance downforce, unique wraparound LED lamp clusters with a brushed aluminum strip tying each side together and a convenient standard power liftgate. Down below is a black contrasted bumper with reflectors, a wide aluminum diffuser and three inch round polished stainless steel exhaust tips at the sides. The looks from the front, side and rear are truly one-of-a-kind. 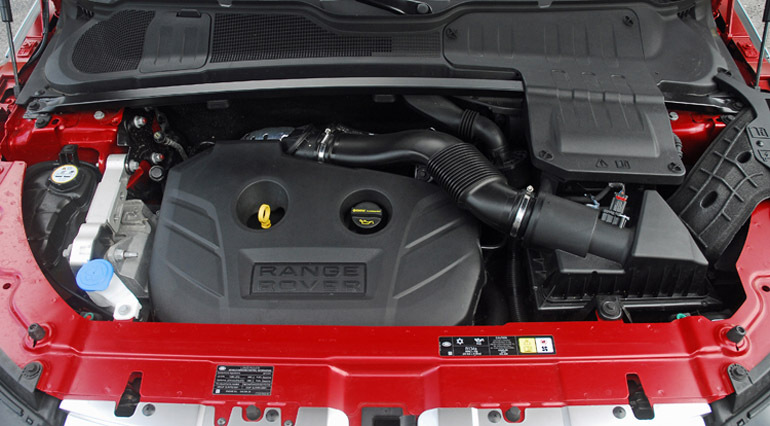 Power to quickly move the new Evoque on pavement or on off-road trails is a 2.0 liter, turbo-charged/intercooled, DOHC, all-aluminum, twin-variable valve timing, gasoline direct injected inline four-cylinder that makes 240hp at 5,500rpm and 250lb.ft. of torque at just 1,750rpm. 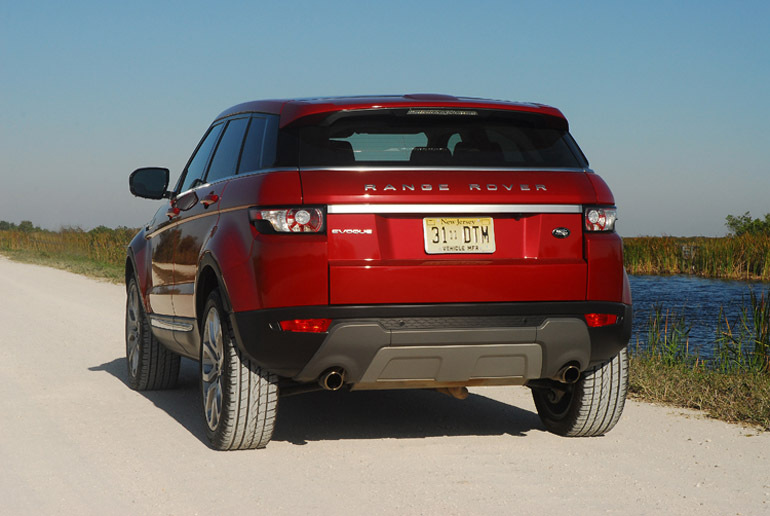 Twin balancer shafts ensure smoothness that is a hallmark of all Range Rovers. The engine is connected to a six-speed automatic that is optimized for efficiency. The paddle shifters give you a sportier ride enabling me to quickly change gears up and down. This truck races out to 60mph from a standstill in just 7.1 seconds, not bad for a 3,902 pound sport utility. It can also tow up to 3,500 pounds. 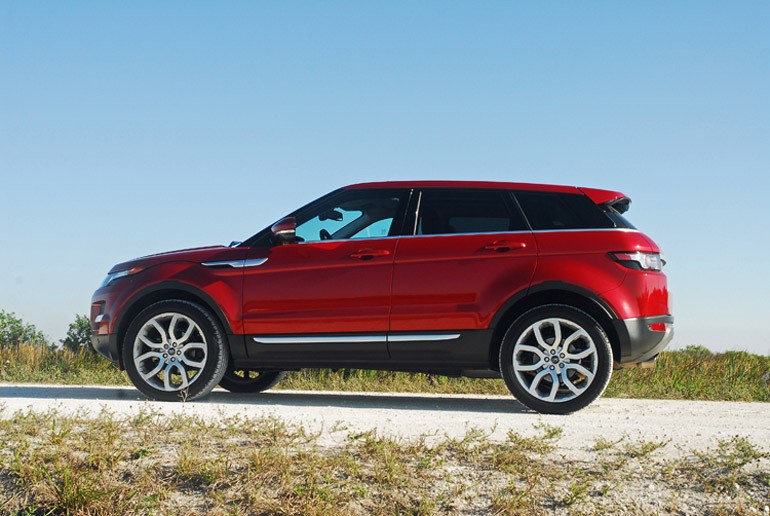 The Evoque’s body structure is exceptionally strong, lightweight (polymer/composite front fenders/tailgate, aluminum hood/laminated glass roof), because of the steel unitized steel structure that uses ultra-high-strength steel and Boron steel in key parts of the safety cell including the A-and-B-pillars, and a magnesium cross car beam to maximize stiffness and torsional ability in all driving situations, on or off-road. While the lightweight, compact footprint and low center of gravity of the Evoque helped it to achieve a more agile character, key engineering steps were taken to deliver the required responses of all types of drivers and driving surfaces. The goal was to increase steering precision and agility at lower speeds using the new electric power-assisted rack & pinion steering system so that the Evoque would be more responsive in city driving conditions. To successfully accomplish this engineers solidly planted the steering rack to the front subframe. The unique fully independent suspension was developed to hug the road with comfort when driving over poorly paved surfaces, to easily maneuver through curving roads and deliver excellent off-road characteristics which are what every Land Rover is known for. Up front is a MacPherson strut setup with coil springs, gas-charged shocks, aluminum lower control arms and an anti-roll bar. The rear setup features a strut assembly with coil springs, gas-charged shocks, lateral & longitudinal links and an anti-roll bar. 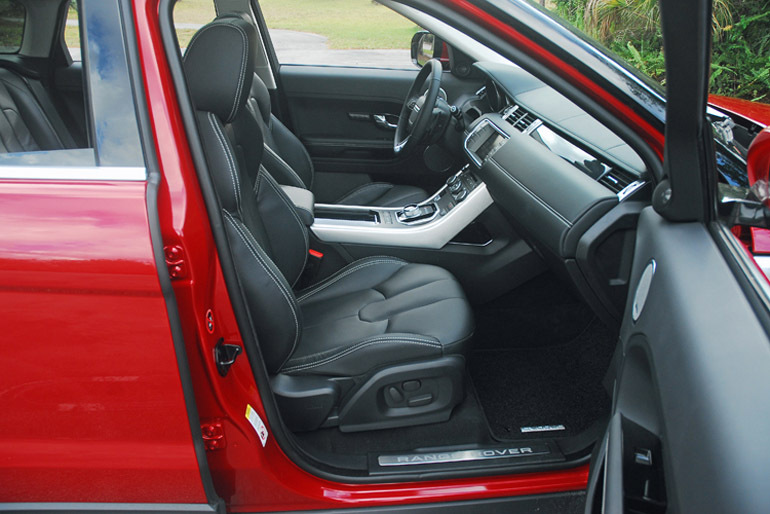 With a strut tower brace up front to enhance rigidity, the new Evoque goes where you point it to go with razor sharp response to your steering wheel inputs. On the road at high speeds it is rock solid and it remains flat in steep curving roads. Off-road it can conquer almost any obstacle with a ground clearance of 8.3 inches, a front axle clearance of 8.4 inches and a rear axle clearance of 9.5 inches. It can also successfully cross up to 19.7 inches of water. This off-road prowess is the result of the standard full-time AWD system that was developed in conjunction with Haldex. The system’s center-coupling technology continuously alters the front-rear toque split through a hydraulically operated multi-plate wet clutch. The system can pre-engage at rest to reduce the wheel-spin from standing starts. It engages quickly when traction loss is detected and disengages quickly to optimize the response of the stability control systems. A high-pressure pre-charge pump pressurizes the hydraulics in the center coupling as soon as the engine is started, allowing for all-wheel drive operation from rest. Full torque transmission can be achieved in just 150 milliseconds. Pre-charging the system also reduces the time taken to achieve full torque once wheel-slip has been detected, engaging with 15-degrees of wheel-slip rotation. 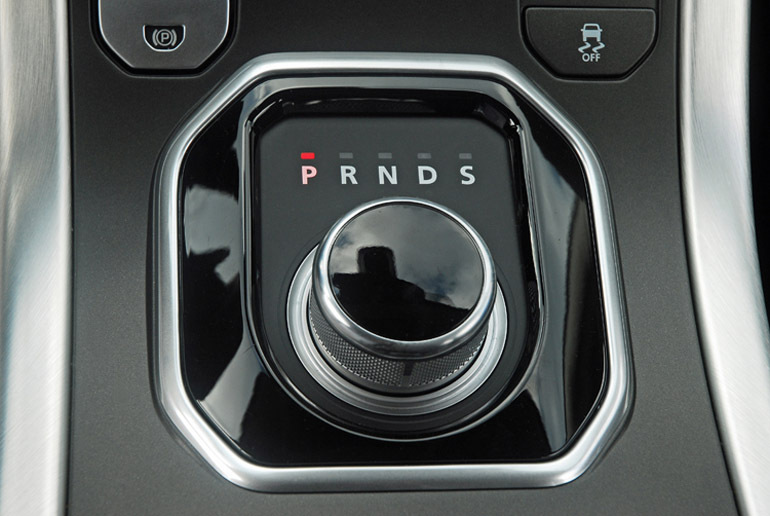 Also standard in the new Evoque is the Terrain Response system which is fully integrated and manages multiple vehicle parameters to provide ideal traction in all situations. The control unit takes into account a wide variety of inputs including individual wheel speeds, cornering yaw rates, longitudinal and lateral acceleration, vehicle speed, brake pressure, accelerator position and the settings of the Hill Descent Control and the Terrain Response systems. The system manages the engine management for the throttle and torque response curves; transmission control when Terrain Response special programs are engages, different transmission shift mappings are applicable, depending on the mode chose. The transmission control module also manages torque converter lock-up, which has different requirements depending on the selected Terrain Response mode. The electronic traction control and ABS brakes controls slip and braking control systems that are all adjusted and tuned by Terrain Response to offer optimum grip, braking power and safety on the chosen terrain. Dynamic Stability Control is designed to stop torque to a wheel after loss of traction, but in some off-road situations torque feed is still desirable, even when traction is being lost. Terrain Response automatically adjusts the DSC so that appropriate torque is maintained. The system also controls the Haldex center coupling for AWD. The standard Terrain Response optimizes the vehicle setup for virtually all on-road or off-road driving situations with up to four settings to suit specific terrain demands. They are General Driving with AWD active and adapts to changing driving conditions; Grass/gravel/snow is for low friction surfaces. It provides high traction control sensitivity to reduce slip, and programs the engine, transmission and differential to provide gradual torque delivery; Sand is one of the most power-hungry surfaces. Sand Launch Control makes it an easier drive-away. Speed-dependent targets for the traction control system permit only very limited wheel slip, helping to prevent the wheel from digging down into the sand; Mud and ruts is used to preserve forward momentum, this setting allows more aggressive traction thresholds in muddy and rutted surfaces and uses preloading on differentials for increased traction. You can find the strip of push buttons on the console. The fifth is the optional Dynamic system that tailors the MagneRide suspension and vehicle responses for dynamic on-road driving with continuously monitored damper settings. 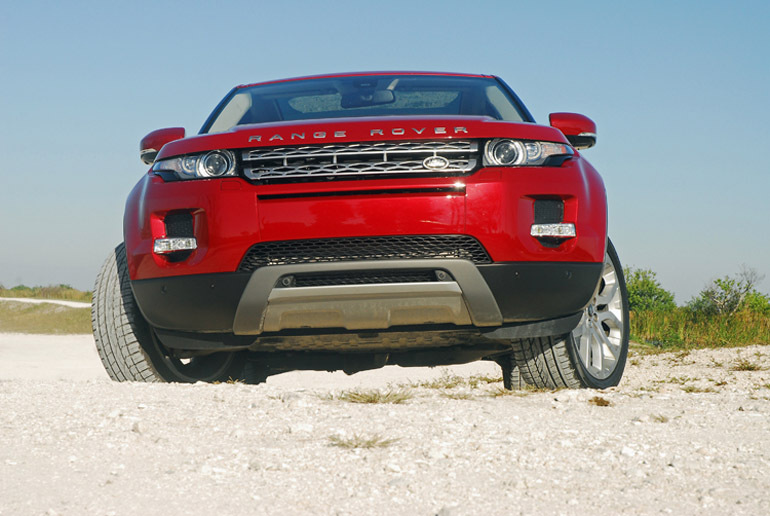 For those consumers looking to explore unmapped off-road areas, Land Rover Off-Road navigation has been added to the Range Rover Evoque for 2013. Other features integrated into Terrain Response include Hill Descent Control, Gradient Release Control, Hill Start Control, Gradient Acceleration Control, Roll Stability Control, Trailer Stability Control and Engine Drag Torque Control. 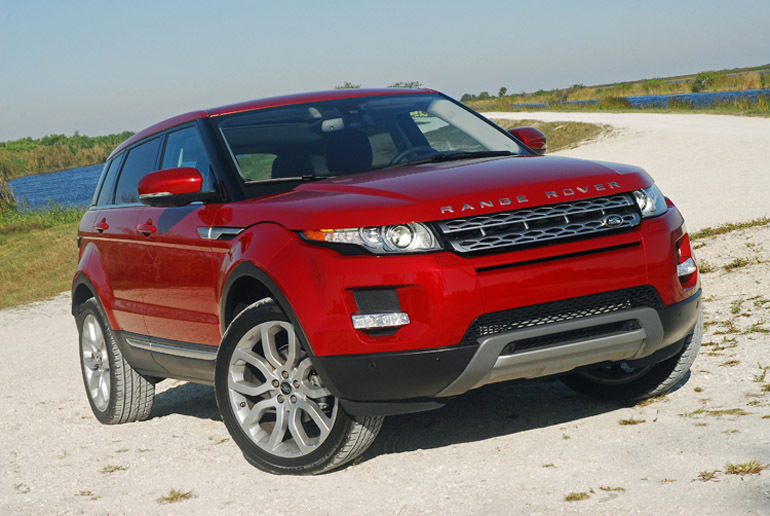 For those consumers looking for new off-road adventures, the 2013 Land Rover Evoque offers an off-road navigation system that provides key off-road information such as topographic contour lines, latitude, longitude, altitude, trace, waypoint and compass functions. Powerful four-wheel disc brakes quickly slow the new Evoque down from speed. Up front are 11.8 inch vented discs clamped with dual-piston calipers while 11.9 inch solid discs in the rear are clamped with single-piston calipers. Braking power is very linear with great feel in the pedal. Control of direction whether on hard pavement or off-road is directed by standard ABS, BA, EBD, Dynamic Stability Control, Emergency Brake Control, Trailer Stability Control, and Cornering Brake Control. 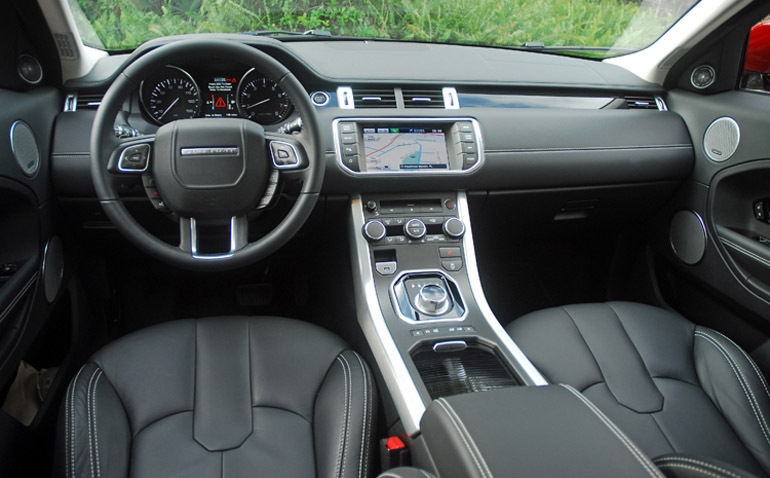 While the new Evoque is rugged the interior is luxurious, comfortable, with the latest in connectivity and safety systems. The front leather-trimmed front bucket seats feature 8-way driver adjustments and 6-way front-passenger power adjustments. The dashboard, dash top, door top and center console lid is covered in Oxford leather with two white stitched seams. There is also real dark wood covering the top of the glovebox. 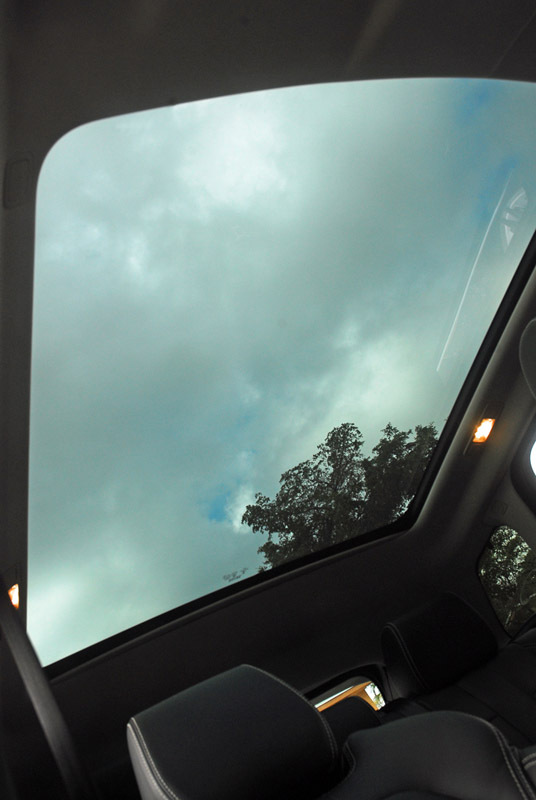 Real aluminum trim is found throughout the Evoque. The leather-wrapped tilt/telescoping steering wheel feels great in my hands. 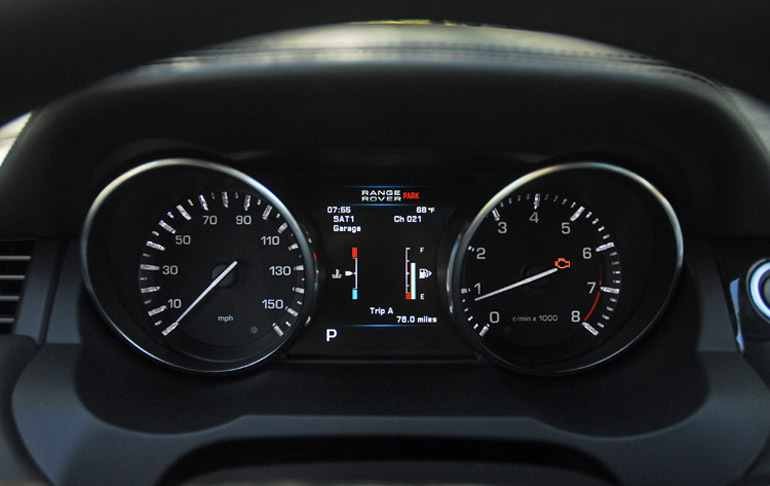 The instrument cluster is very well designed an easy to understand with 5 inch TFT Driver Information Center. When you push the start button the rotary transmission switch raises from the console, just like in the current Jaguar vehicles. It is unique and easy to use. Just beyond the switch are the controls for the Terrain Response system. Other standard equipment inside includes power windows/door locks with front express up/down control, dual-zone automatic climate control system, electronic cruise control with the controls on the steering wheel, heated sideview mirrors, self-dimming rearview mirror, adjustable ambient lighting, bright finish front kick plates at the end of the cargo bay, 60/40-split rear folding seat with a pull-down dual cupholder and storage box, Bluetooth telephone connection, 380-watt with 11-speaker Meridian audio system with AM-FM-CD player, MP3 disc and file compatibility, USB & iPod connectivity, with streaming audio, 8 inch high-resolution color touch screen, power opening/closing tailgate, rain-sensing wipers/washer, a hidden rear wiper/washer, storage slots in each door, dual map lights, dual lighted vanity mirrors, keyless entry and vehicle security system, cargo cover, and thick-cut pile carpeting. Optional equipment in my Prestige Evoque model includes 20X8 inch wheels and tires as mentioned above, carpeted floor mats, load space storage rails, passive entry, surround camera system, HDD navigation system, intuitive voice control, Meridian surround sound audio system with 825-watts and 17 speakers, custom Firenze red paint, Sirius satellite radio, extra tuff rubber floor mats, and Xenon adaptive headlamps. Standard safety equipment includes seven-airbags including front/side driver/front passenger, side-curtain airbags, height adjustable front seatbelts, 3-point safety belts for five with front load limiters/pretensioners, child lock for rear doors, LATCH system for child seats, front/rear distance control with a rear camera. I’ve driven dozens of sport utility vehicles but I have never received so many positive responses wherever I went behind the wheel of the new Evoque. It has great on-road manners and easily maneuvers over off-road challenges with an interior that is a signature of all Land Rover vehicles. The base price for an Evoque is just $41,145.00 and $56,393.00, including destination, for the Prestige model with all of the options. 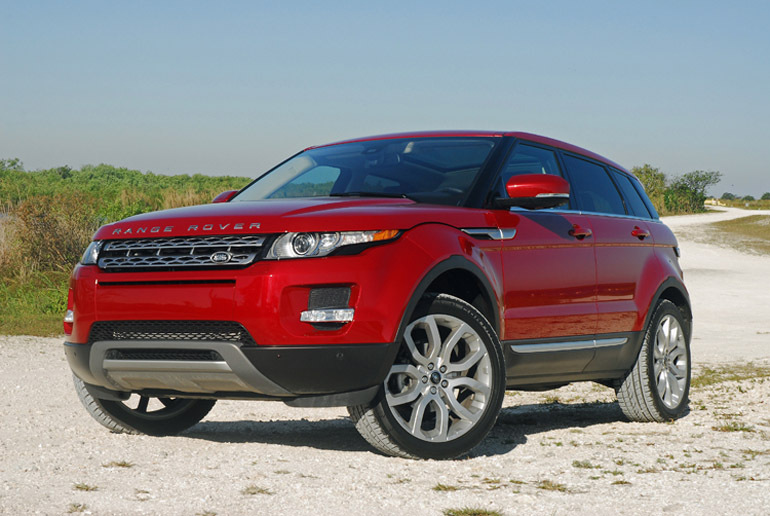 Land Rover Building More Range Rover Evoques For The U.S.